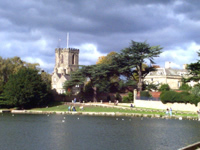 A large village close to the city of Derby that is mostly residential. There was once a large number of market gardens in the area, although the amount is has now dropped substantially in recent years. There is a Norman church that dates from the 12th century, the Parish Church of St Michael & St Mary, built on the site of a former Anglo Saxon building. Melbourne once had a Castle, but all that remains is a solitary wall behind Castle Farm. The castle was originally dismantled in 1460. Melbourne Hall and gardens is open to the public. It was built in the 17th century for the Bishops of Carlisle.